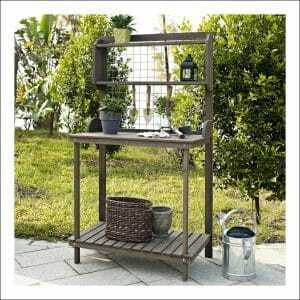 Potting benches offer a dedicated and comfortable workplace to take care of your garden plants. 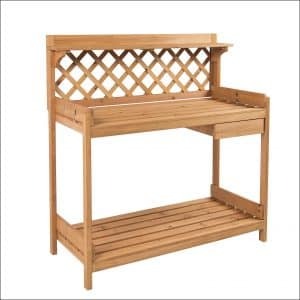 If you are considering buying a potting bench then you are most probably making the best decision ever for your garden. Different types of potting benches are available for you, so you’ll need to be well informed in order to choose the best potting bench for your garden. Following is a buying guide and a list of the top 10 potting benches in 2019, they should hopefully help you to make the right choice. 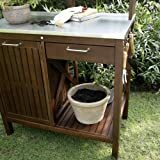 Material: Potting benches can be made from a wide range of materials, although the most common ones are made from wood, metal, and plastic. Since they are basically outdoor furniture, you’ll have to consider their durability. Treated wood can last, but so too can galvanized metals. Extreme temperatures can quickly wear down plastics, making their cheaper prices irrelevant in the long run. You will have to consider all this and strike a balance between material quality and cost. 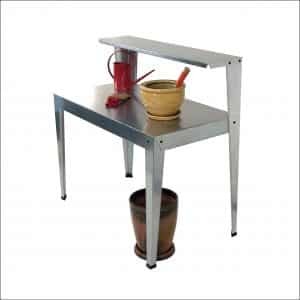 Height: Most potting benches are as high as kitchen counters with 36 inches. 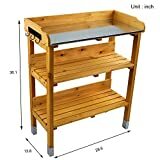 If you are too tall or short for this, then you might want to try out a potting bench with an adjustable height. This will allow you to set the right height for yourself and to avoid stooping, which might lead to back pains. Style: Some potting benches are more elegant than the rest, while others are just very basic and simple. If you like stylish stuff, then you might want to check out the more luxurious versions that enable you to garden in style. If you are on a budget on the other hand, then you might just want to forget the stylish ones. Size & Surface Area: This is a decision you’ll have to reach by yourself since you are the only one that knows how much space you have in your garden, as well as how much table space you will be needing. 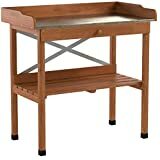 Featuring pre-cut parts and pre-drilled holes, you will find this potting bench easy to assemble. It also comes with all hardware necessary for installation included. Made from PVC vinyl and containing a high level of titanium dioxide, you can be sure that this table will last you a long time to come. It even comes with a 20-year warranty. Cleaning it is easy, simply spray with a garden hose and you are good to go. 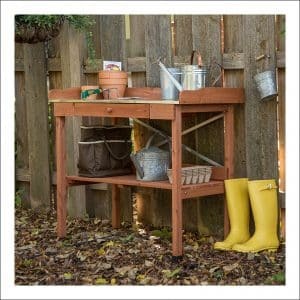 This Greenfield potting bench is 49 inches high, 19.5 inches deep, and 48 inches wide. While PVC vinyl is a great material with plenty of beautiful qualities, this bench will still never be as durable as a metal or even wooden potting bench. If you desire a potting bench for your garden with a rich finish, then why not take a closer look at this one. Made from acacia wood, it measures 37 inches in width, 21 in depth, and it is 56 inches high. This lovely bench additionally includes a stainless steel work surface plus a tilt-out bin and double-pronged hooks on its sides. You also get plenty of shelf space both on top and below. 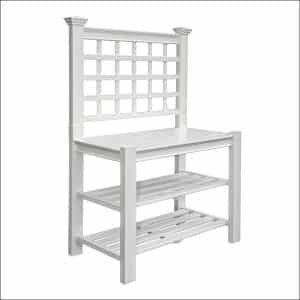 As beautiful as this potting bench is, it does have a little setback though, and that is its price, which is many times over the average pricing for potting benches. If you do desire a wooden potting bench, but you don’t feel like paying so much, then here’s a good bench to consider. It is made from wood and includes a plastic sink. There are 2 open shelves offering you enough space for your gardening tools. The top workspace is spacious as well, measuring 44 inches by 18 inches. It is 34 inches high, while the upper shelf is about 13 inches higher than it. One issue with this bench is its plastic sink. Since most people usually leave their benches outside, the weather can easily destroy the plastic sink. Coral Coast’s offer is 37 inches wide, 21 deep and 66 inches high. Crafted from fir wood, it is stable and durable. 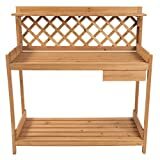 There are 2 additional shelves to provide extra storage space and a wire back which functions as a hanging grate to provide even more space to hang your garden tools. The wood is well treated and is sure to resist many years of extreme weather. 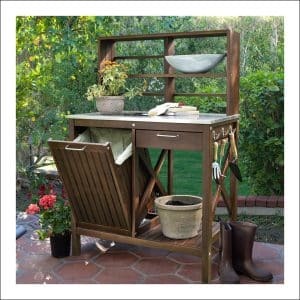 Although this is a highly functional potting bench with nice features, it is just not very visually appealing. It could look nicer. 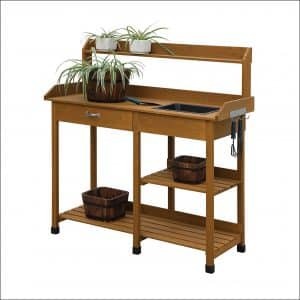 How about a potting bench with an amazing 20-year warranty? 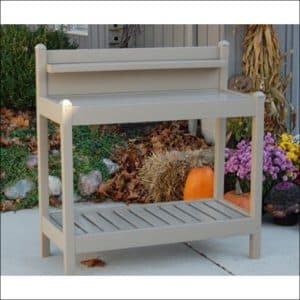 New England Arbors offers this vinyl potting bench with such a warranty. Being made from vinyl means you don’t have to repaint it, as is often the case with wooden or metal ones. It is 65 inches high and 32 inches wide. The tabletop is 32 inches high and the entire thing weighs just 26 lbs. There are 2 lower shelves for storing equipment and a hanging grate above the tabletop for your convenience. Being a lightweight piece of garden furniture does have its drawbacks. It cannot carry lots of weight and it can be easily blown away by the wind. Available in 2 styles, this Jewett Cameron potting bench is quite lightweight but very sturdy. It features a heavy-duty metal frame and either composite slats on top or a wire mesh design. You will need to assemble it first, and this requires just a screwdriver and about 30 minutes. The lower shelf is height-adjustable and a trimmings bin is available for your convenience. This bench measures 39 (width) x 32 (height) x 15 inches. Since the lower shelf space was already height-adjustable, it would have been much better if the tabletop’s height could as well be adjusted. Still, it is a great bench for anyone who loves modern styled furniture. 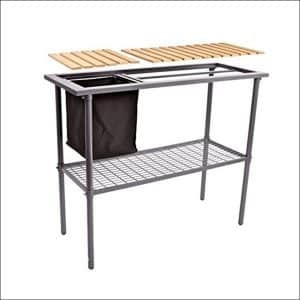 Featuring a galvanized steel construction, this potting bench will perfectly resist all weather conditions for many years to come. You will also find it a joy to clean up and maintain. Setup is fast and simple and it measures 44 inches in width, 24 in depth and 44 inches in height. 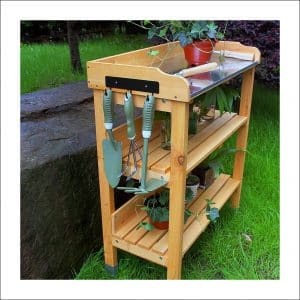 Here comes a potting bench anyone would love to have in the garden. It features an all-natural glow and is a beautiful garden furniture in all respects. Made from solid fir wood, it is easy to assemble and to disassemble in just minutes. This table measure 28 inches in length, 36 inches in width, and 13 inches depth. The top is waterproof and there a 2 lower shelves, providing enough space for most of your tools. The legs have also been moth-proofed for a longer life. Made from cypress wood, this potting bench offers you certain additional features such as weather-resistance and insect- resistance. Its tabletop measures 38 by 21 inches, which is enough working space. It is 36 inches high and includes a metal topping. You can choose to either use this bench in its natural and raw form or to oil or paint it. This bench even includes a drawer for keeping some of your valuable stuff and a lower shelf also for storage. It is a high-quality furniture that you’ll always be happy to have. If you love gardening and natural things, then this should tickle your fancy. This table is made from solid fir wood and features a natural wood finish. The design is well thought out and it looks very stylish, making it an equally good decorative furniture. You get the workbench and the lower shelf for easy soil access, plus an overhead shelf for extra space. It measures 45 (height) x 44 (width) x 20 (depth) inches. As beautiful as it is, it still requires some finishing work from you, if you want it to last for a very long time. Simply waxing or oiling it once a year is okay. There is an extra side drawer for holding your tools and other items, and this increases the value of this bench. We have reached the end of this top 10 potting bench reviews and the turn is now yours to make a choice. If you want an all-metal solution, then the galvanized bench in 4th place will be great. Else the number #1 bench is perfect for any wood lover and it is also reasonably priced.